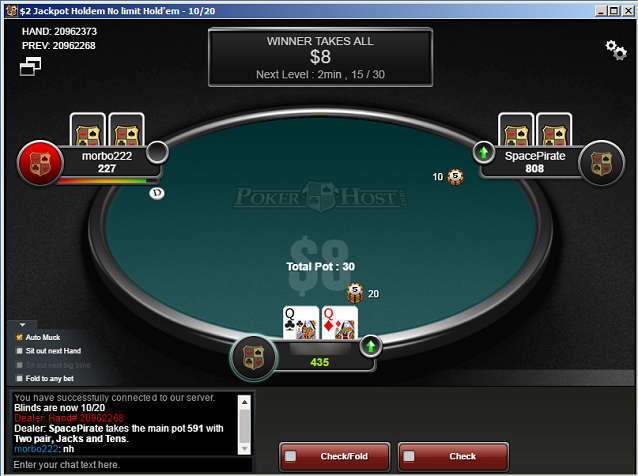 Pokerhost is one of the leading online poker rooms on the Winning Poker Network [WPN]. PokerHost [PH] has been serving poker players for more than a decade. PH, formerly on the Merge Gaming Network, left due to Merge Gaming's slow payment issues. PH moved to the up-and-coming Winning Network. WPN is currently the second-largest online poker network, as measured by both cash game volume and multi-table tournament volume, that still provides online poker games to USA-based players. WPN also services a wide array of countries worldwide and is enjoyed by European and international Rest-of-World (ROW) players as well as US players. Professional Rakeback highly recommends PH for a variety of reasons. Its independent cashier is not only robust with options, but it's one of the fastest US-facing cashiers available. They often manage to pay US players in 2-5 business days. Payout times to non-US players via Neteller are also typically 2 business days or less. Another reason for our trust in this company is due to its commitment to player satisfaction. PROFRB has been working closely with Poker Host for nearly 4 years as of the posting of this review and we are very happy with the way they treat our players and ourselves (hey, we play poker too!) Below, PROFRB will delve into the promotions, VIP programs, deposit methods, bonuses, rakeback | cashback equivalents of said bonuses, cashier details, cash game and tournament data, and more! Pokerhost offers a tremendous amount of deposit and reload bonuses to its customers. These bonuses are available to any customer who has signed up with the appropriate "PokerHost Affiliate Code." The Professional Rakeback Pokerhost Affiliate code is 10699. Once a player has created a new account under our affiliate code, all future deposits, be they an initial first time deposit bonus or a perpetually available reload bonus, will be applied to the customer account without the need to enter any bonus codes. Stated another way, if you sign up with Professional Rakeback, all your future deposit bonuses will be automatically credited to your account, without needing to enter codes of any kind at the time of your deposit! All first-time depositors are eligible to partake in a 100% up to $1,000 bonus. This bonus is earned and cleared during play at any cash table, sit-n-go, or multi-table tournament. Your first deposit also earns you access to up to four depositor's freerolls that can be found in the poker client lobby, listed as "New Depositors Freerolls." These freerolls take place every Saturday at 12:05pm Eastern Standard Time. A minimum deposit of $20 is necessary to earn any initial bonus. This deposit bonus clears in $5 increments per 137.5 player points earned. This effectively comes out to an additional 20% rakeback on top of the VIP program or 27% rakeback program depending on which you choose. Players have up to sixty days to clear as much of the bonus as possible before it expires. Poker Host, in conjunction with Professional Rakeback, offers 27% flat rakeback to all of our account holders. Unfortunately, the set up process takes an extra 2 minutes of your time, but it's worth it. All you have to do after signing up below is contact live chat or send them an email asking to be swapped over to 27% flat rakeback. It's that simple. Rakeback is weighted contributed, and it is redeemable on demand. Once per day you can request your rakeback and it will be paid between 12-1am EST, directly to your player account. Your rewards never expire, so you may also accumulate your RB for as long as you wish and cash it in at your leisure. Step 3: Click the PokerHost banner above - if you use ad blocking software the banner above may not be visible. Try clicking this direct PokerHost link instead! Step 4: Click the "SIGN UP NOW" button (click here a for visual guide). Step 5: Fill out their standard account creation signup form with your personal information. If you need help, please follow this template. Step 6: (optional) Skype or Email us your username and registered email address if you would like us to confirm your new account was properly created. Do you want rakeback? If so, you need to contact customer service at PokerHost. This simple process is done by hopping on live chat or emailing phaffiliates[at]phsupport.co.com and asking to be swapped to Professional Rakeback's flat 27% rakeback program. Just be sure to email from your registered email address and include your username and it should be taken care of within 24 hours or less. It is important that you email them before you start playing, otherwise your rakeback will not kick in until the 1st of the following month. Step 7: Download the poker software. Step 8: Deposit and play! Optional: For advanced players ProfRB recommends Holdem Indicator or the PokerTracker heads up display HUD to maximize your edge on the tables. A variety of cash games are offered on PH, including the ever popular No-Limit Hold'em (NLHE), in all the popular formats such as full ring (FR), six max (6m), and heads up (HUNL), as well as fixed limit (LHE) games. They also offer a variety of variations of Omaha, including Pot Limit Omaha (PLO), No-Limit (NLO), Fixed-Limit (FLO), Omaha Hi, and Omaha Hi/Lo (PL08). The cash game software allows for an above average amount of hands per hour to be dealt, keeping the action crisp and enjoyable. As stated above, the Winning Poker Network is currently second in online poker network cash game traffic for US-facing operators. Due to aggressive advertising and excellent promotion value, we expect traffic to continue to rise in the months ahead at PokerHost and WPN. No-Limit Holdem [NLHE] games start at the micro stakes and go up all the way to 25/50 blinds, $5,000 USD buy-in games. Pot Limit Omaha [PLO] games also exist at these same stakes. FLHE games go all the way up to 30/60 as does Fixed Limit Omaha. At PokerHost, there are a few avatars for you to select from. After you select your avatar, you can adjust how it appears by clicking on it on the tables and choosing from five images, designed to reflect different emotions. These avatars are allegedly entirely fictional and don't bear any intentional resemblance to real individuals. Yet, after looking at some of them, we can't help but notice that a few of them appear to be based on well-known celebrities. Pokerhost serves up a solid multi-table tournament schedule in daily and weekly forms. Whether your bankroll is denominated in cheeseburgers or Maseratis, there are bound to be tournaments that allow you to play at the level you desire. DAILY TOURNAMENTS: The $1,000 Gtd at 3:00 pm ET costs only $5.50 to join and is spread Mondays - Fridays, but if you’re working a day job at that time, then just wait a few hours. At 11 o’clock an identical tournament will run again. If you like collecting bounties, then the $5.50 + $2 Knockout tourney at 9:00 pm is a great opportunity for you because it guarantees $1,250. WEEKLY TOURNAMENTS: The Sunday Special $150,000 guaranteed runs on Sunday afternoons, giving players a chance for a big score! With a buy-in of $215, this is a must-play event for all serious MTTers. If this buy-in is a bit too expensive for you, then try the $25,000 Gtd on for size because it only costs $22 to enter. Both events start an hour apart, so, heck, why not play both if you can afford it? Saturday evenings, you can enjoy the Saturday 12 Pack - $10,000 Gtd, which costs $30. SPECIAL TOURNAMENTS: Stay on the lookout for the $500 + $40 Million Dollar Sunday. This event is held every few months and awards a prize pool of no less than $1,000,000! Buy in directly, or earn your seat in one of numerous satellites. If you’re interested in playing multiple events, then you’ll get the chance to do so several times per year because PokerHost holds pretty frequent tournament series. Sit-N-Go tournaments, or SNGs, are offered as well on WPN and PokerHost. SNG's of the NLHE variety are spread with buy-ins ranging from $1.61 up to $1,215. These NLHE single table tournaments (STTs) come in several formats including Regular Speed, Turbo Speed (turbos), and Hyper Turbos (hypers | supers). Additionally, JackPot poker SNGs have been added, which are very similar to PokerStars Spin and Goes but with better structures. SNG 2.0 is also offered. 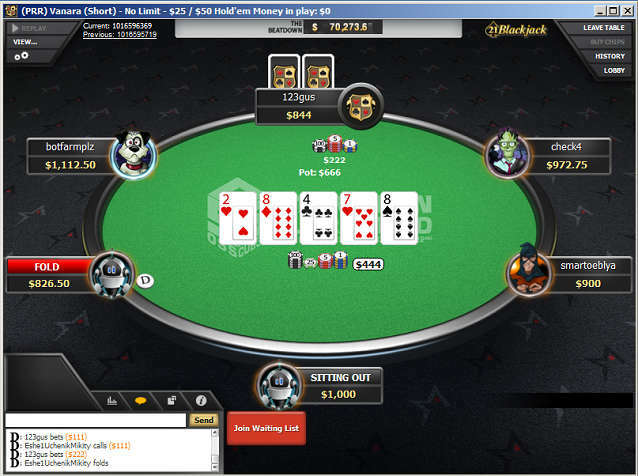 This is a nine-player form of poker that's only available at the Winning Poker Network. It seats nine and has a pregame round that involves revealing cards to try to make a streak of the same color and thereby grow the prize pool. Any PokerHost customer who has already made deposits totaling $50 or more over the life of their account is eligible for this exclusive promotion. PokerHost will give you a FREE $10 tournament token on your birthday each and every year! You’ll need to contact support, and then a FREE $10 credit will be applied to your account so that you can play a $10 tournament, sit-and-go, or cash game on the house! Please note that you have thirty days with which to spend your token or it will expire, and a small rollover requirement of $50 in rake (275 loyalty points) and/or tournament fees must be completed before the funds may be withdrawn. If you elect to receive rewards from PokerHost’s VIP program, called the Platinum Reward Program, instead of opting for rakeback, then you’ll earn Master Points with every hand you play or tournament you enter. As you progress through the tiers, your rate of Master Points accumulation will get higher and higher. With your Master Points, you can purchase items from the PokerHost Store. Every site on the Winning Poker Network has such a store, but most of them restrict you to just trading your points in for cash. PokerHost, on the other hand, stocks a wide array of physical goods, like computers, cameras and speakers, as well as the standard points-for-cash options. PokerHost rewards you not just on your initial deposit but on subsequent ones as well. After making a reload, you’ll get entry into a $100 freeroll called a “Shockwave.” If you become a friend of PokerHost on Facebook, you can also gain access to $15 Shockwaves. Besides this, ladies can enter a $50 Ladies Night freeroll every Thursday while gentlemen (and we use this term loosely) can partake in the Testosterone Poker Night on Tuesdays. ROW clients at PokerHost enjoy a variety of withdrawal methods including Neteller (3-4 business days), MG, and more. NOTE FOR ROW PLAYERS: Deposit using Skrill and/or Neteller! Brand new US-based clients used to be limited to cash transfers and checks from PokerHost as far as payouts went, but now the site fully supports Bitcoin payouts as long as a deposit was previously made with this digital currency. A variety of other methods (bank wires for example) are only made available to clients once cleared by the Risk Department (account verification, volume play and higher balance clients get access to more withdrawal methods more quickly). A client may request a maximum of one cash transfer withdrawal per week. Checks can be requested up to four times per month, but only one can be sent per week. Deposits can be made via Credit Card, WU, MG, and, of course, Bitcoin. Accounts funded via CC deposits have far more stringent requirements before said account can participate in peer-2-peer transfers. Deposits are almost always free at Poker Host – that's right: Poker Host will refund your deposit costs for WU and MG as long as the value of the transaction is more than $100! Thus, WU and/or MG are quite attractive, but Bitcoin is even better because it never has any fees either when depositing or withdrawing. Moreover, BTC comes with a maximum permitted transaction size of $5,000, far greater than any other processor available at PokerHost. Also check out ProfRB.com's reviews of all US Poker Sites payout time-frames. PokerHost is not able to accept players from the following countries: Afghanistan, Malaysia, Pakistan. The following US States (due to network and legal restrictions) are also blocked: Delaware, Kentucky, Louisiana, Maryland, Nevada, New Jersey, and Washington state. However, players in US territories Guam, Puerto Rico, the North Marianas Islands (including Saipan) and the Virgin Islands are accepted. What deposit bonus does PokerHost offer? When you make your first real money deposit at PokerHost, you'll be able to get a 100% up to $1,000 poker bonus that will release $5 every time you collect 137.5 Loyalty Points. This works out to be equal to 20% PokerHost rakeback. How can I track my bonus progress? You can see your bonus status at PokerHost within the poker client. Go to the "Loyalty Points" tab, and then select "Bonuses." You'll see any poker bonuses you have active, the amount that's currently available to be redeemed, and your bonus history. What poker network is PokerHost on? PokerHost is part of the Winning Poker Network. What distinguishes PokerHost from the other network sites? The main difference between PokerHost and the rest of the WPN is that it operates its own independent cashier that provides long-term customers with certain withdrawal options, like bank wires and direct deposit, that are missing from the other sites on the network. Limits are also higher on some methods that are supported at other WPN rooms. Does PokerHost participate in The Beast and Sit & Crush leaderboards? Yes, PokerHost allows its players to compete in these network-wide promos to try to win thousands of dollars in cash and satellite entries every week. However, it has a different name for each of them. PH refers to The Beast as "The Beatdown," and it calls Sit & Crush "Sit & Go, Crush Your Opponents." FOUR color deck please? -- Open a table. Now look to the upper left-hand corner. There are 2 gear icons. Click on them. When the window opens, select "Themes." Click on 4 color deck. I don't like the default sounds. Can I change or disable them? -- Yes you can. Open a poker table, look to the upper left hand corner for the "gears." Click the gears button, then choose the Sounds tab. Now you can select individual sounds and use the browse feature to find other sounds to replace the defaults, or even to disable certain sounds.